NBA – The defending and reigning NBA Champion Golden State Warriors will host Game 1 of the 2018 NBA Finals against the visiting Cleveland Cavaliers at Oracle Arena in Oakland, California. The Warriors and the Cavaliers are facing their 4th straight NBA Finals where the Warriors has 2 – 1 advantage in their Finals matchup. In 2015, in their first NBA Finals match, the Warriors defeated the undermanned Cavaliers in 6 games (4 – 2) to win the 2015 NBA Finals, Andre Iguodala was named the Finals MVP. LeBron James co – All-star Kyrie Irving and Kevin Love was out in the series due to injury. In their second consecutive meeting in the 2016 NBA Finals, The Warriors posted the best record in regular season history of 73 – 9 they are the favorites of winning back to back NBA Title? But when the Finals begun the complete and healthy Cavaliers made history as the only team to ever come back from 3 – 1 deficits to win the NBA Championships. Cavs able to steal the championship and stun the Warriors in Game 7 where LeBron James was named as the Finals MVP ending the 52 years of drought of any championship in Cleveland History. 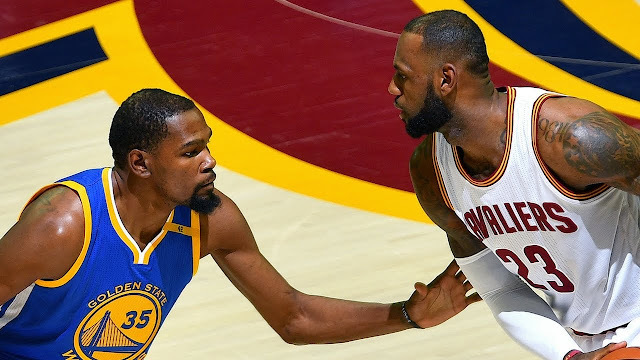 In their 3rd consecutive meeting in the 2017 NBA Finals, the Warriors added former OKC superstar Kevin Durant during the NBA Off-Season to join forces of eliminating LeBron James in the Finals. The Warriors plan succeeds as they destroy LeBron and the Cavs in 5 games (4 – 1) handling LeBron James 5th loss in the Finals. This 2018 NBA Finals, the Warriors are the favorite to win the 2018 NBA Titles against LeBron's team Cavaliers, the Cavs is predicted to either sweep or loss in 5 games? No one is taking the Cavs to win the series unless LeBron James will show a superhuman strength to carry the Cavs over the talented Warriors. Who do you think will win this year NBA Finals “Warriors/ Cavaliers 4”? No Comment to " Cav's or Warrior's Which Team Will Draw 1st Win of the 2018 NBA Finals "